You might have noticed searching for resources on our website looks a little different. The access to our resources remains the same, but we have an improved search engine with a new look and feel for exploring and discovering the Libraries' holdings. It also offers easier viewing of your library account for renewing books, requesting holds, etc. The new system merges the online Library Catalog and the Libraries’ All Search into a single interface. You can access the search box on the library's homepage. What are the benefits of signing in? The library search can help you find books, e-books, journal articles, newspaper and magazine articles, open access sources, music, movies, streaming media and more. Use the limiters (or facets) on the side of your results to help narrow your search by Source Type. Check the box "Add results beyond your library's collection" in order to see material the library does not have in full text. As always, if we do not have immediate access to a resource you can request it through interlibrary loan. Is everything included in the library search? 1. In the Library search box, you can select the EBSCO search scope from the drop down menu. While searching the EBSCO databases, you will notice that there are very few "facets" on the left hand side to focus your search. 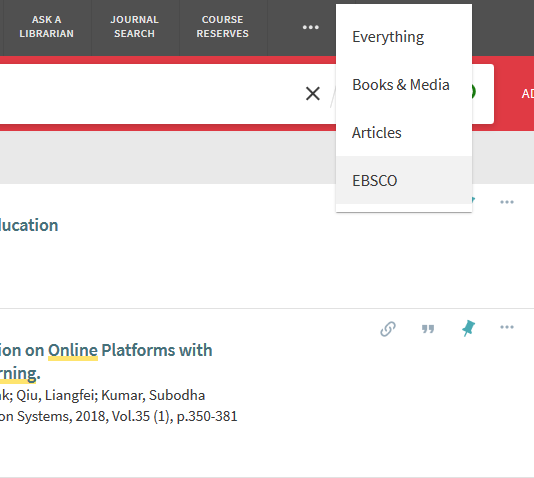 If you are having trouble finding good articles or books in EBSCO, another option is to go directly into those databases. See option #2 below.